In the further adventures of Steff Sells Everything to Travel for Five Years, there’s this, written over lunch. I got inspired afterwards and walked all over town and even shot a fun timelapse video of riding one of Lisbon’s funiculars, now a “national monument,” and really, a must-do when in town. In the end, I leave with fewer regrets and an even stronger desire to return. Nonetheless, I think snapshots like this are important in the reality of being a digital nomad, and so I’ll post it anyhow. Follow me on Instagram and Facebook for day-to-day updates, if so inclined. It’s my last day in Lisbon and the prospect of packing for Porto begins tonight. For some reason I’ve woken today with a weather migraine and healthy dose of regret. I feel like I somehow failed Lisbon. I chose restaurants poorly, had some underwhelming experiences, but I know it was me, not Lisbon. 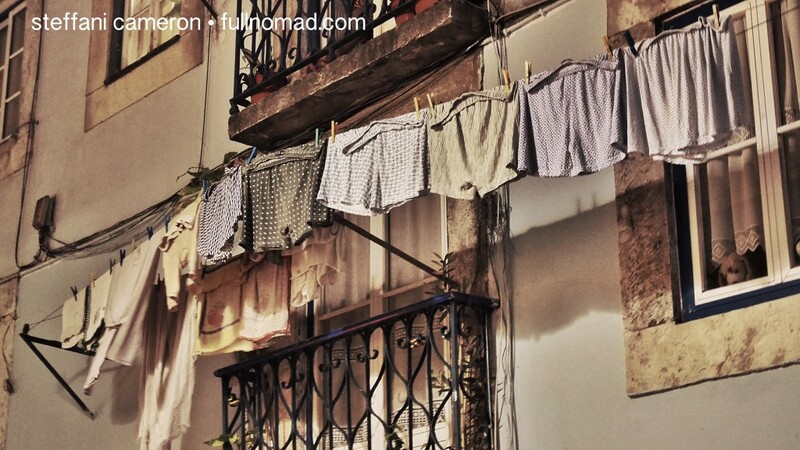 Okay, so a post like this feels a bit like I’m airing my dirty mental laundry, so why not share a photo of boxer shorts drying in the night of Lisbon’s Bairro Alto? I have the luxury, though, of knowing I get a do-over. I’ll be back again in the fall and will likely spend two weeks and next time I’ll get it right. I’ve felt “off” for most of the week. I can’t really explain it. 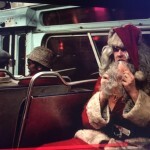 Maybe it’s to do with it being Christmas-but-not; I’m not feeling Christmas but it’s kind of all around me. December 19th? Are you kidding me? It’s 20 degrees and feels like September in Canada. I might as well be a million miles from home. I get fleeting moments of homesickness, but not really, because I’m living a pretty awesome life, right? Like I say, it’s hard to explain. 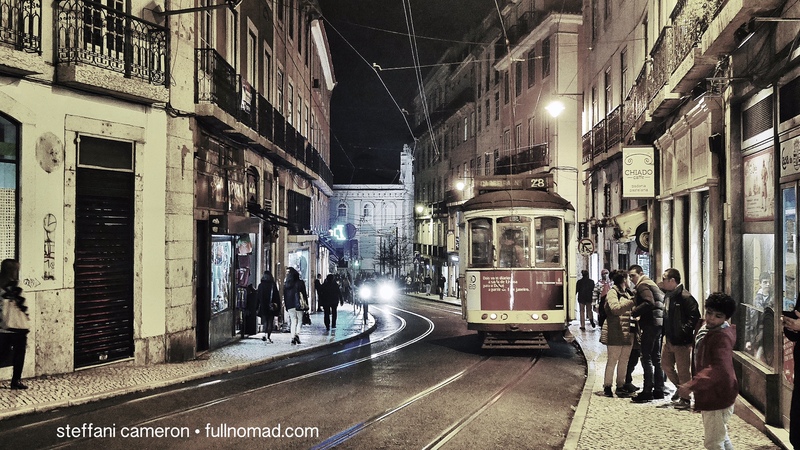 The iconic Lisbon trolley by night in the Bairro Alto ‘hood. If there’s one thing this funk I’m in has taught me, it’s that I’m right to want to stay a minimum of two weeks anyplace I go. If I have a few “off” days, suddenly the whole week seems a waste. But with two weeks, it’s easy to rebound and explore more. That’s the trouble with a long-term travel life. There’s a sense of guilt that comes from not always being “on,” as if one should feel such undying gratitude to be in yet another amazing location that they should be out and doing All The Stuff All The Time, but life isn’t meant to be a 24/7 party of experiences. Down times are essential. But when all you’ve got is a few days in any given place, how do you stop and just BE there? Sit down. Be. Repeat. That’s how to be present in any given moment. I know without doubt that there is more to Lisbon than what I have seen, and sure, I have this feeling of regret that I didn’t get an “A+” for my Lisbon Explorer badge, but I also don’t care. iHuman, not iRobot. It was my mistake to book only a week here. I feel it needs more. This is one of those cities I want to just sit on the plaza and watch life unfold around me. I want to get on a trolley with no idea where it’s going and just hop off and do my thing. I want to return to my apartment, nap, get up, and do it all over again on the very same day, living my life in shifts because this city seems to seldom sleep. In an area likely seldom seen by tourists, a residential area where it seemed like I was the only misfit. I don’t even know where I was, but I wasn’t far from the “hot” areas. Felt great to wander there today, though. No, one week isn’t enough for Lisbon, not for someone like me who’s working their way around the world and has to time-manage on a daily basis. 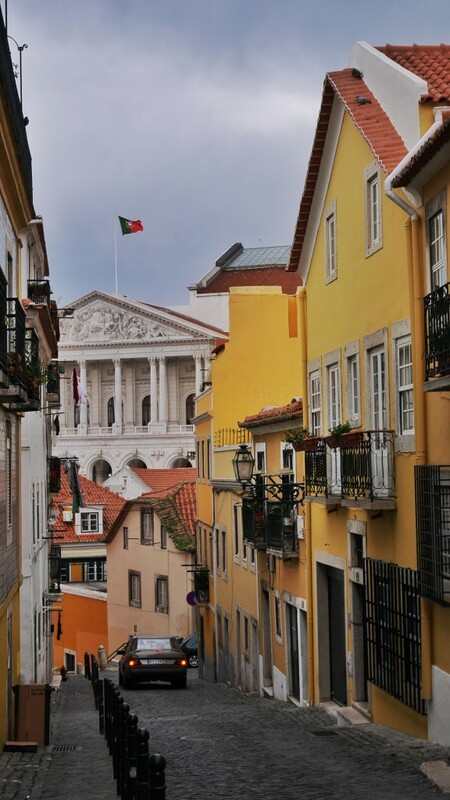 For someone visiting Portugal only for 2-3 weeks, then a week is plenty of time, if not too much time, because there’s so much to see elsewhere in this little country, from the little I have experienced of it so far. My happiest day this week was when it was blissfully sunny and everywhere I went I found someone playing music, and I could stop to linger and enjoy the moment. 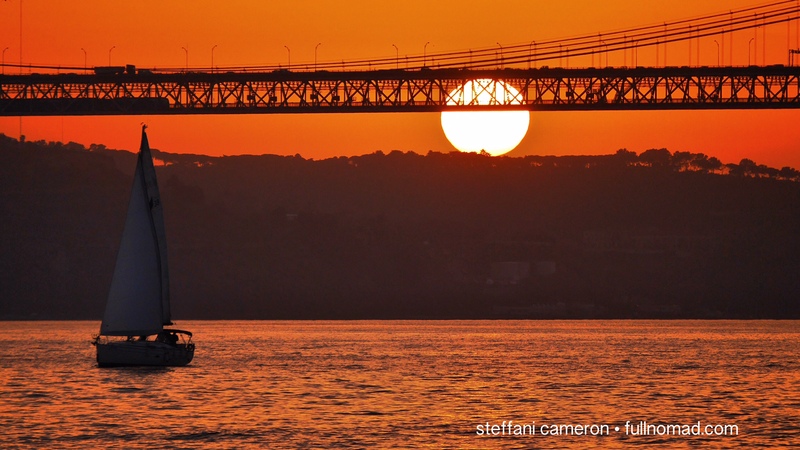 That’s the kind of city this is, one where you’ll stumble upon beauty and magic in spots, and if you don’t stop to savour the moment, that’s when you’re failing to Lisbon properly. I feel like “Lisbon” really should be a verb. This place is pretty alive. One must Lisbon the Lisbon to feel Lisbonned. There, verby. 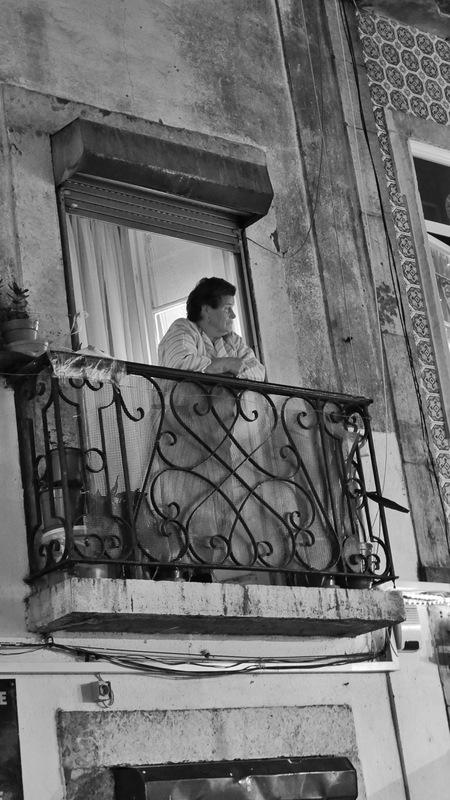 A woman surveils the Bairro Alto on a warm December night from her balcony. I love spying on people who are spying on people. Among my largest mistakes was bothering to spend excess money on food, and food not of Portuguese descent. I think there are a lot of small, simple places doing food right for value prices, and it doesn’t need to be complicated or fancy. A simple bifana (pork filet sandwich) from a corner luncheonette can be a wonderful experience. A bowl of sopa Alentejano (poached egg in a garlic broth with bread and cilantro) can warm you up on a cloudy day. A casserole of arroz de pato (duck rice) is the simplest food but so satisfying. Simple galic and water broth with olive oil, poached egg, cilantro, and bread. 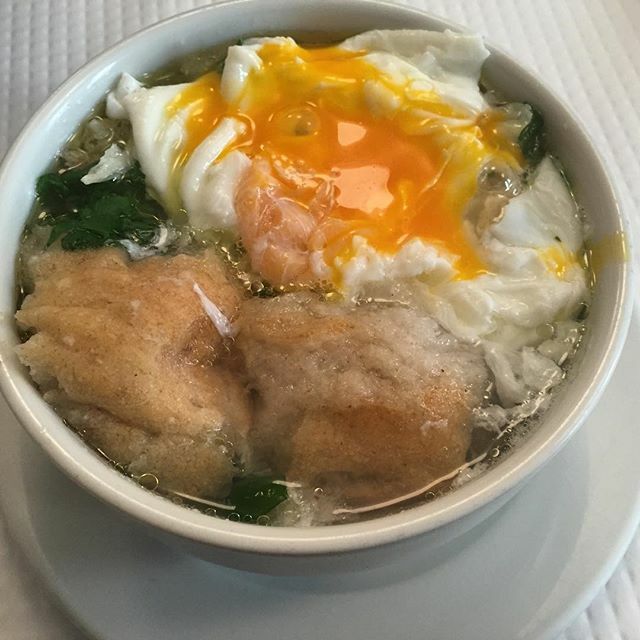 Once the egg is broken and mixed with the soup, the broth becomes creamy, not filled with chunks of cooked yolk, as you might expect. I paid 3 euros for this, or about $4.50 Canadian, in a “fancy” restaurant, but it’s a recipe I could easily make at home with fond memories of a great city in the years to come. Oh, so traditional. These lessons on dining for less and experiencing more won’t go to waste, of course, because I will be back next November, and tomorrow I arrive in Porto, where much of this will serve me well. 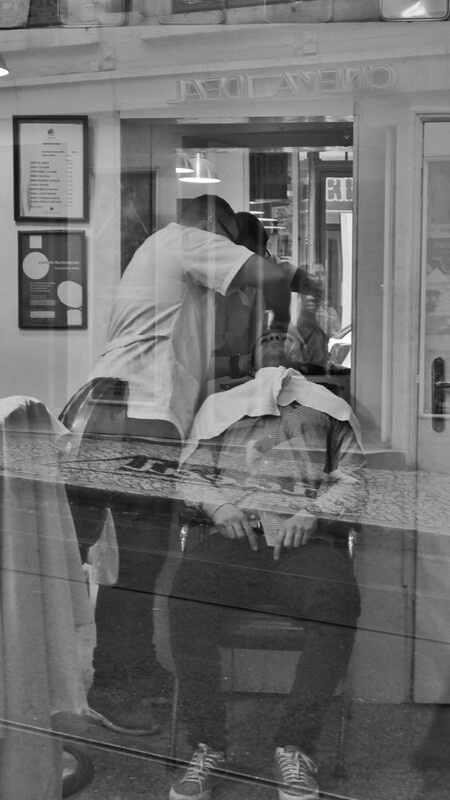 I will look for more blue collar experiences and skip the fancy things. I will savour simplicity over complexity, just like I would back home. Most importantly, there will be six weeks for me to experience Porto. Time enough for bad days, lazy days, and rebound days. Time for rainy days off, sleep-ins, late nights, and much more. Future travels too will come with times I feel I’ve missed out on the pulse of a place, and days when I feel like I’ve tapped into its very soul. I will sometimes feel I’ve failed to discover what makes it tick, or feel I’ve unearthed its very essence. Just because I’m living life abroad doesn’t mean I get a life without disappointments or misfortune. It just means I’ll be more exotically situated when they strike. Whatever my feelings in my migraine-fogged day are today, I have no regrets about coming to Lisbon, and I have no doubts that I’ll return. Just like Zagreb, it didn’t really go as I anticipated, but the charms and lifestyle of the city still found its way into my heart. Return, I will. Thanks for the memories, Lisbon. My last sunset in Lisbon. It was cloudy and windy and threatening to storm this evening. I think 10 days is too few, a month may be a bit too long. I think 2-3 weeks is about perfect.